SARTrack is based on an ‘un-docked’ window system, that is, all windows are separate, and can be moved anywhere independently. The primary reason for this design was to enable the use of multi-monitor systems, in particular the use of a video projector displaying the Map, while other windows could stay on the laptop screen. A single small Main Menu window from which all primary windows can be started stays on-top at all times. Each window has its own basic settings, which means the User will not be subjected to a main window overloaded with settings and icons, which is unfortunately becoming very common. For example, the Map window will have most settings needed for that window, while the SAR Log window will only have settings required for that window. All effort has been made to made to keep the program as easy to use as possible, while only showing the user only what he or she needs to see. 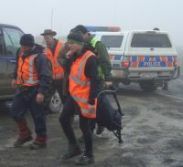 When the original New Zealand version became an International version, intended for both Search and Rescue and Amateur Radio operators, an option was added in the main Setup to switch between SAR and HAM operation. When SAR is selected, the SAR Log system becomes available, and various other settings in the program appear or disappear. SARTrack now makes heavily use of OSM (OpenStreetMap) compatible Online servers for the Maps. These maps, based on a system of small Map Tiles, can then be saved for off-line use during SAR operations in the field. This off-line use saving of Tiles is not allowed when using Google Maps or other commercial Map systems. - A primary Map window for all OSM-compatible and Local Maps, with many Maps including Topographical maps for Canada and the USA, and Topographical maps for the rest of the world. - Transparent Overlays are possible, and a User configurable file for OSM servers is included. - A full APRS system, including an advanced APRS Message system, Stations, Objects, etc. - Selectable overlays on the Maps, like Map outlines, Grid, Radio-Range, etc. - Warning when Stations (Trackers) time out, and warnings when Priority beacons (from Trackers) are received. - A Replay system, which makes it possible to replay an entire day of a SAR Operation, including the Tracks, Messages and the SAR Log, with a timer window showing when it all happened. - The SAR Log can be exported in a delimited form. - There are many more features in the program, to discover it all, download and install the software, if is free. SARTrack is completely stand-alone, runs on Windows 2000 and higher, does not use any libraries, does not use .NET, does not use the Windows Registry, does not load any things on Windows start-up. Updates will be checked for once a day, only when SARTrack is started. To be able to track up to many stations, and to display them on a topographical map. All Map data to be locally available on the laptop (no Internet required). Every station (tracker) to get a Tactical callsign, separate colour track, Icon, customizable Screen label. Screen Labels to change color if the station has timed out, or has send a Priority message. Warning systems to show stations loss of signal, and Priority Warning with screen and Audio signal and selectable Message. A Priority Icon to show on the map when priority signal received. Also automatic log entry. Event Log (Running Log) system, which enables the operators to enter Log entries with pull-down lists for all active stations. Automatic Log entry in case of Priority Signal received, or loss of signal, and when Icon Markers are added by the operators. The Log can be added to from multiple computers, both locally and remote. The Radio operator can enter Log entries which will then show up on the Controller PC, and any other PC's active on the search. Option to print out Log entries and messages on the local printer (on an entry-by-entry basis). Capability for operators to add special Marker Icons on the map, with detailed data attached to it, including documents and pictures. Capability to draw search areas on the map and share with other computers. Dual Screen capability, where the Map screen can be displayed on a separate monitor or video projector, while all operational displays are on the laptop screen. Capability to network several computers and share all data, so a radio operator can enter Log entries and view location of stations, and the operations team view the map and operate another laptop in the operations room. Capability to connect to an Igate server via the Internet, if available, to share all Tracking data with computers across New Zealand. A messaging system which enable all computers to communicate encrypted text messages with each other, even if only connected by radio. A 'Text Message' system which enables Radio based computers to send one-line emails and TXT messages to mobile phones. All data, tracking information, events, log entries etc. to be stored immediately and permanently on all connected computers. Capability to re-play the entire Search on the screen. To print out the Log system and tracking maps at the end of the search. Extremely easy to use, following all standard Windows conventions, such as dragging the Map by left-mouse down and drag, zooming in and out with the mouse-wheel, right-clicking on Icons on the screen and get a pop-up menu with all options, etc. As many functions as possible should be automated. No requirement to use the more advanced functions; the program should work and start tracking right after startup. At the time of writing (Updated February 2013), most of the above functions have now been incorporated in the program, and the program is at Beta level. The APRS software is now available for FREE as an International version. But, why would you use SARTrack?